Manga Monday (10) : Horror Manga I want to read. Hey everyone, welcome back to another Manga Monday! Since it's inching ever closer to Halloween I figured now would be the perfect time to share some stories that I've yet to read but sound delightfully disturbing to say the least. This series starts with 54 young women gleefully jumping in front of a train together and committing suicide. One girl name Saya Kota survives unharmed and becomes obsessed with death. She forms a Suicide Club and starts recruiting members to join. Her best friend Kyoko tries to stop her and the other members from completing their task of committing suicide. However, Kyoko quickly realizes other forces much stronger than her don't want that to happen. If this plot seems familiar it is. This manga is based on the 2001 Japanese film Suicide Club by Sion Sono. The Manga differentiates from the film by adding a survivor to unravel the very complicated plot and it also simplifies the story some while adding in more back story to the characters not really fleshed out in the film. Can a modern, westernized society stand up to the brutal forces of nature? When an ebola-like virus pops out of nowhere in the middle of Tokyo and begins brutally infecting and leaving behind a field of infectious corpses in its wake, modern Japan does not have the capablities to contain the disease behind bureaucratic red tape and laws. What would it happen if, to Shinjuku, one of the biggest districts of Tokyo, a man came to empty of his blood in the street at broad daylight? How would the political and sanitary authorities manage the drama? Think, please, about the question as long as you still have the possibility of it because for the professors Onodera and Sekiguchi it is already too late! An emergent virus begins to insinuate itself slowly into the arteries of the Japanese capital? Emerging is a Manga after my own heart. I love Plague stories especially those based on very real viruses. For me that just makes them creepier and more intense. The story revolves around 35 year old Manga artist assistant Hideo Suzuki whose life seems to be stuck around his exhausting but low-paying job, unfulfilled dreams, strange hallucinations and unsatisfying relationships. He sees himself as a supporting character in his own life, has low self-esteem, resulting in frustration. One day, the world as Hideo knows it is shattered by presences of a disease that turns people into homicidal maniacs, whose first instinct is to attack and devour the nearest human. Armed with only his sporting shotgun, he runs for his life, meeting strangers along the way. All the while, he and his companions struggle to stay alive, while questioning their moral choices. I keep meaning to pick this Manga up but it always seems to slip my mind when I actually mean to. Nonetheless, I am Hero is a zombie tale that I really, really, want to read. I've heard nothing but good things about its story and plus I know a movie was based on it so I'll definitely like being able to compare and contrast the two once I've read it. Framed and convicted of murder, Yoshiaki Maeda has just arrived at Shouran Academy Juvenile Detention Center. He is placed in Cell 4 and is soon greeted by his fellow inmates Gou Iwakura, Masafumi Yoshioka, and Mitsuru Yamanoi, all of whom have been detained on varying charges and sentences. Already believing life to be laden with misfortunes, Yoshiaki finds, to his dismay, that the prison is in the midst of a violent power struggle. However, things are about to get even worse—little do the inmates and employees know that the outside world has been thrown into chaos by a sudden zombie apocalypse, and a van carrying infected humans has just crashed into the prison, abruptly introducing them to the undead threat. 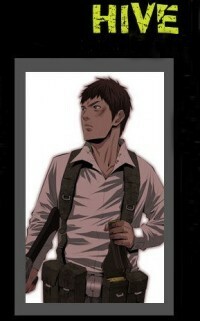 Yup, this is another Zombie Apocalypse Manga. What can I say, I love my zombies. I don't really know much about this Manga but I was drawn to it because of the artwork and also as I mentioned already Zombies. I'm hoping to track down a copy of this soon so I can devour it. Yup, you heard that right this is a bug apocalypse. After reading and devouring The Hatching (not a Manga) earlier this year I've been tracking down a lot of bug related stories. This Manga or Manhwa as it is Korean fits that bill and then some. This is a small sampling of a very long list of Manga on my tbr. These choices however are right near the top of that list so that is why they were chosen for this particular post. If you'd like to see more of my choices leave me a comment below and I might just post a pt. 2 in the coming weeks. Are you excited for Halloween ? Have any spooky reading recommendations you'd like to share?